Those involved in the search for Serenity Dennard hold a press conference to update the search Monday. RAPID CITY, S.D. – Authorities say they will spend the next few days reassessing where they go from here as an expanded weekend search for a missing 9-year-old girl turned up nothing. 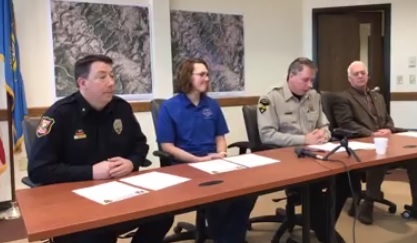 At a press conference Monday, Pennington County Sheriff Kevin Thom says the investigation into Serenity Dennard’s disappearance is still active, but they need to regroup before another search is held. Serenity ran away from the Black Hills Children’s Home near Rockerville on Sunday, February 2. Thom says the search for her outdoors is a recovery effort, assuming she did not find a warm place to be or get picked up by someone. Those are two scenarios, he says, they have not abandoned yet. Thom says 355 personnel have participated in the search, along with 33 agencies and 14 canine teams. A helicopter from Rushmore Helicopters and the Civil Air Patrol also participated. Thom couldn’t go into much detail about the investigative side of things, but mentioned a few legal proceedings regarding the case. "As of today, we have conducted 115 interviews, we served 2 search warrants, largely related to the legal process in the records we're looking for. We've canvassed 10 businesses to see if they had any video we could use, and 7 of those had video that we reviewed. We have also used our Internet Crimes Against Children to do some computer forensics for us. And we're currently following up on 23 leads we've received." Also participating in today’s conference was Bill Colson of the Black Hills Children’s Home, who says his his staff just wants to bring Serenity home. "We're all focused on bringing Serenity home. That is true of the children here. The staff. All these amazing people who have been working to bringing her home." Colson says as is the case with all such establishments, the Black Hills Children’s Home is licensed by the state, and the staff has been very professional in handling this tragic incident and working with investigators. There were no official searches today for Serenity, although authorities say if they have information that they think may help investigators, to call the sheriff’s office.